Measurements: 2.95 x 4.65 inches; or 75 x 118 millimeters. Back of card: Solid white with four black wolf paw prints. Kind of stark. This deck is not to be inverted. Booklet included: No. For instructions, there are two cards. One card describes the deck & author, the other gives brief info on an 8 card spread. Publisher: Wind Spirit Productions, Sedona, AZ. Printed in Belgium. Comments: Despite the name, this is NOT a tarot deck. There are no major arkana, no minor arkana, no suits. 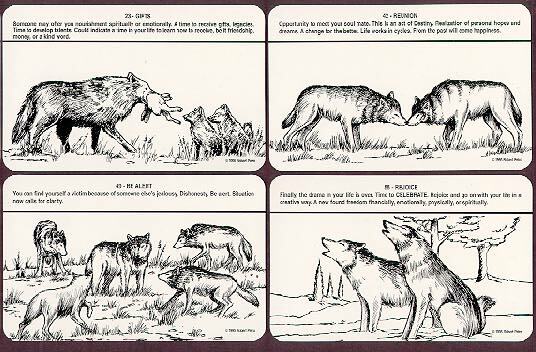 There are 60 images of wolves at work & play & many of them look worried. The symbology in the illustrations is underdeveloped (in our view), so we saw no point in showing more of what look like very boring cards. Mysteriously, an extra copy of card No. 30 was included with a note apologizing for a slight misprint on the other copy. We've studied & studied both of them & the only difference we can find is a small print smear on the replacement card. As cards for general guidance, these are okay. They are generally in good taste, the texts are loving & caring. Here is the text of number 30: "GUIDANCE Someone has or is about to enter your life as a teacher. Great opportunity to advance. Reading a book may change your life. Guidance can come in many forms. Listen to your intuition."